A little bit of old, a little bit of new and lots of out of the box thinking makes this Ténéré Tracker unlike any other, and that’s always the way it was meant to be. 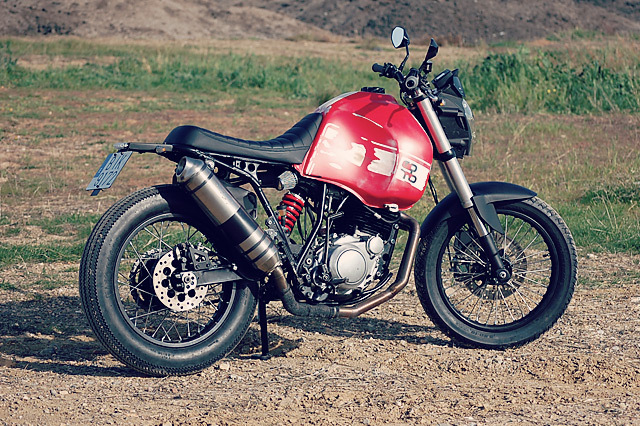 Starting with a “fit for the junkyard” ‘89 model Yamaha XT600, Santiago Garcia of Corb Motorcycles in Spain had a very unique vision of the sort of bike he wanted to build for himself. 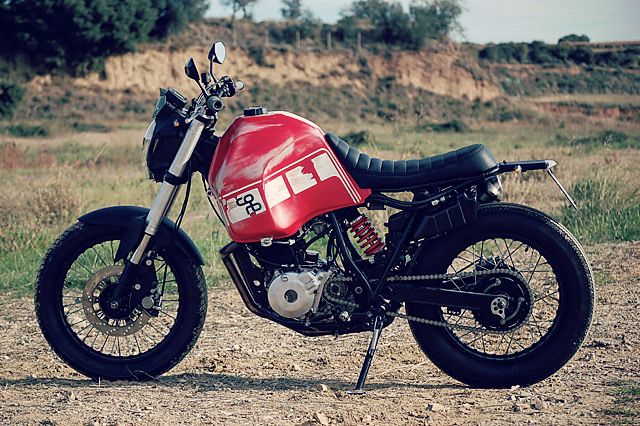 For more than 6 years in the city of Terrassa, 30 km from Barcelona, Santiago has been churning out customs for his clients and gaining an impressive following of fans and other local builders all determined to keep the true spirit of motorcycling alive. But when you build customs every single day and you finally find time to build something for yourself, it creates a chance to push the boundaries in every way. Nearly 30 years of hard work had the XT needing a thorough strip down and clean with dirt, mud and bugs in just about every corner and crevice. With the Yamaha stripped to its bare frame the rear end was shortened 10cm by removing material from the subframe and then re-welding the rear section back in. With unnecessary tabs and brackets removed it was time to hit the sandblaster to rid the metal of any imperfections and old red paint. While shooting a coat of black would be easier and cheaper Santiago wanted an Enduro like durable finish and had the frame powder coated black instead. With the shorter subframe and different look he was trying to achieve a new seat was fabricated and leather wrapped that fits perfectly between the rear end and flows up onto the tank for comfortable riding even on harsh surfaces. The decision to buck the trend of small road bike tanks on dirt bikes to create a tracker look was a deliberate one but rather than just go conservative Santiago went the whole hog and tracked down a tank even larger than standard. This particular item is the 1986 long-range tank fitted to the Ténéré Dakar model of the XT600. The Ténéré takes its name from the desert region in the south central Sahara where running out of fuel is just not an option. 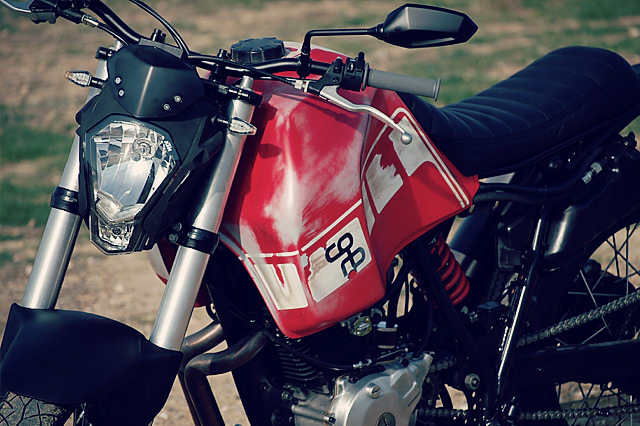 The tank was then sent out to Bryan La Tinta who laid down a stunning Yamaha Red with White Speed Blocks and the Corb Motorcycles logo in Black. Then with the tank back on the frame Santiago grabbed some sandpaper and other implements of destruction and set about ageing the pristine paint in what he calls a “savage style”. It’s the sort of thing that gives painters nightmares, their work is their baby, but a builder has a design in his mind and to that he must be true! By the time the 2KF model made it to Europe there had been significant improvements to the engine to aid in reliability. The 600cc thumping single with four valves might not rev like most similarly sized machines but that’s not what it was made for. Yamaha recognised that Europeans were buying these bikes for trips to the African continent and increased cooling fan area, improved lubrication throughout the engine and a strengthened gearbox made for a machine that could go where no help was available. 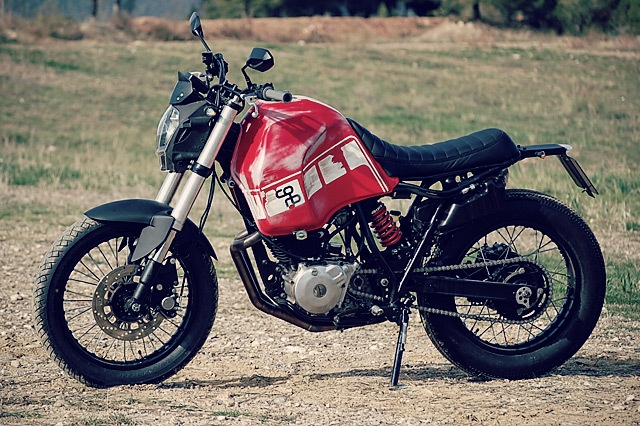 To squeeze a little extra zip from the thumping single, the exhaust is hand-made from beautiful stainless steel pipes and finished out with a muffler from a KTM 690. The XT offers a throaty induction roar at the best of times but this build breathes even easier thanks to twin pod filters and are matched with a similar filter for the oil breather. While the big travel telescopic forks of the ’80s were great for the sand dunes and back roads, suspension technology has come a long way in a short period of time and Santiago wanted only the best so the front now swings a set of late-model Yamaha FZR USD forks and trees designed to work with the XT frame. The basic monoshock rear design remains in place but the long travel standard unit has been ditched for a YSS shock normally fitted to a Ducati Monster. 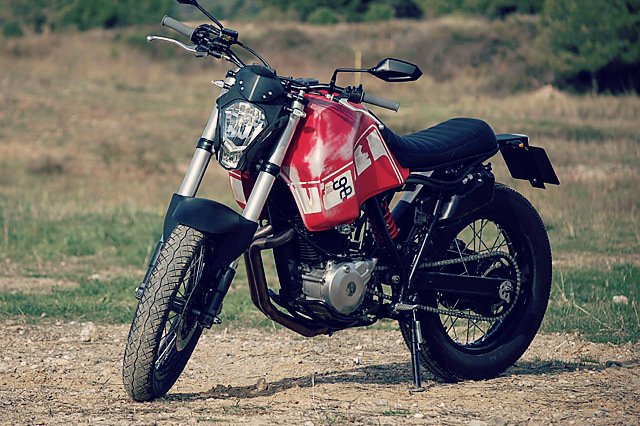 The result of the changes gives the bike a lower centre of gravity, improved high-speed handling and a much improved sealed road experience with the modern suspension taking care of a lot of the thumpers vibration. Still wanting to retain the enduro bikes brakes an adapter was made to mount the standard front caliper to the new forks. The wheel and tyre combo is a true mix of old and new; up front the standard hub has been laced to a new rim before being fitted with a Bridgestone BT45 3.50×18 tyre, while out back the newly laced original rim sports a true tracker legend in a 4.50×18 Firestone Champion Deluxe. 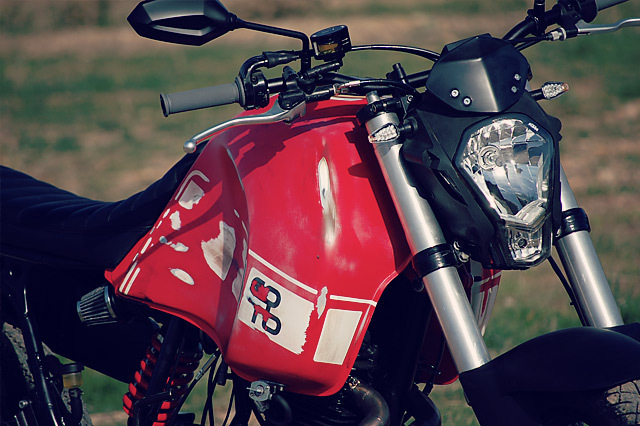 Wanting to keep the XT road legal required the fitting offenders, the front is an FZR item stripped of its paint and leaving the raw plastic finish with the rear a one piece guard also acting as the license plate holder. The box like XT headlight was never going to work so Santiago adapted a KTM390 Duke item with a digital Koso speedo mounted above. New low-rise wide bars were fitted into the clamps for extra leverage with modern mirrors and new grips working with the headlight to create an entirely more modern front end. 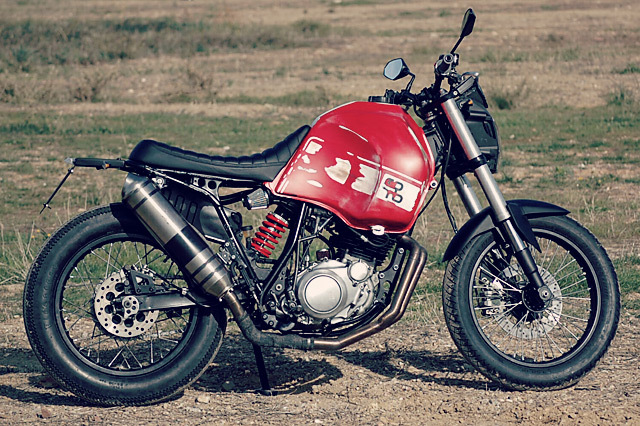 Not only has Corb Motorcycles now got a new shop bike for fun rides anywhere and any time, Santiago has created a talking and challenging the norms and stirring the pot will keep that conversation going for a long time.